Every boulderer who likes Organic Climbing products struggles to choose between Organic Full Pad and Simple Pad. They look similar, and in fact, use the same material, have the same size, and are equally strong. So, what actually is the difference that these pads have from each other? The availability of pocket flap and the price of these pads are the differences these pads have. Otherwise, they are almost similar in many features. Let’s look in detail about the similarities and differences between these pads to help you choose the best to buy. When to Buy Simple Pad? Landing Surface 36"x 48" 36"x 48"
Open Size 36" x 48" x 4" 36" x 48" x 4"
Folds Down To 36" x 24" x 8" 36" x 24" x 8"
If we have to differentiate between Organic Full Pad and Simple Pad in just two words it would be the pocket flap. Simple Pad is the streamlined copy of Full Pad. The looks are similar, the size is identical, materials used are exactly the same, and both of them are the products of Organic Climbing. But, what really sets them apart is the pocket flap. Unlike Full Pad, Simple Pad does not have the sewed pocket flap. Some boulderers like to own pads that are really simple and without any extra nonessential features. Organic Climbing addressed the needs of such boulderers by introducing Simple Pads in the climbing world. If Simple Pad owners want to have a pocket flap for easy piggybacking multiple pads, Organic Climbing offers attachable Load Flap that costs USD 33. So, this gives them the option to use the pocket flap and remove it while spotting the pad for bouldering. Organic Climbing built these pads by using the finest of materials. They use the foams of the same materials in both these pads. Organic Climbing has used a unique and tough foam in between two layers of soft open-celled foam. The 1” hard foam of soy-based ingredients is dense and has the capacity to absorb high impacts. Likewise, the 3” soft layers of memory make sure you get enough cushioning even in big falls. Both Organic Simple Pad and Full Pad have the same shell materials. The shell materials of both pads are US-manufactured 1050d ballistic nylon which are the same materials that bullet-proof vests manufacturers use in their products. So, you can imagine how durable the shells of these pads are. Likewise, the pad tops, the landing zones, of these pads are of 1000 Cordura. Many boulderers praise the high-quality landing zone of these pads. These highly durable materials prevent wear and tear of the mat even in excessive use. Foams of many other brands’ foldable pads start to wear out from the fold crease. This is not the case with Organic Full Pad and Simple Pad. Both Simple Pads and Full Pads use the hybrid hinge that is a part taco and partly hinge. The bottom 3” foam uses hinge closure whereas the top 1” foam is a single sheet that folds in a taco-style. With the hybrid hinge, the foams of these easily foldable pads do not wear prematurely. In both pads, there are three metal hook and loop buckles on the side of the pads and one buckle lies on the bottom for the closure system. Both Pads have adjustable shoulder straps, sternum stabilizer, and 2” hip belt. The two-level suspension system makes it easy for short people to adjust the shoulder straps for a better fit. For added support, hip belts of both pads are compatible with Organic Climbing’s Deluxe Hip Belt. With the Deluxe Hip Belt, you can increase the support of the suspension system of your pads. This lets you piggyback a massive load of multiple pads to long distances easily. Full Pad has updated closure straps affixed on the pocket flap which lets you attach other pads like Half Pad, Blubber Pad, or Briefcase Pad. Both of these pads have three grab handles for easy handling. The open side of pads have two handles and the remaining one sits on the hinged side which gives you the option to carry your pads from various spots. Simple Pads and Full Pads weigh about 11 pounds each. Although the Full Pad has the added pocket flap, it increases the weight of the Full Pad insignificantly. At 11 pounds, these pads are not among the lightest of crash pads, but they are not on the heavier sides as well. You can carry them on your back easily and hike for hours. Organic Simple Pad costs you USD 175 whereas Organic Full Pad has a slightly higher price of USD 185. As there is only a small difference between the price of these pads, the price is not a big factor to determine which pad to buy. Both the pads are aesthetically pleasing. 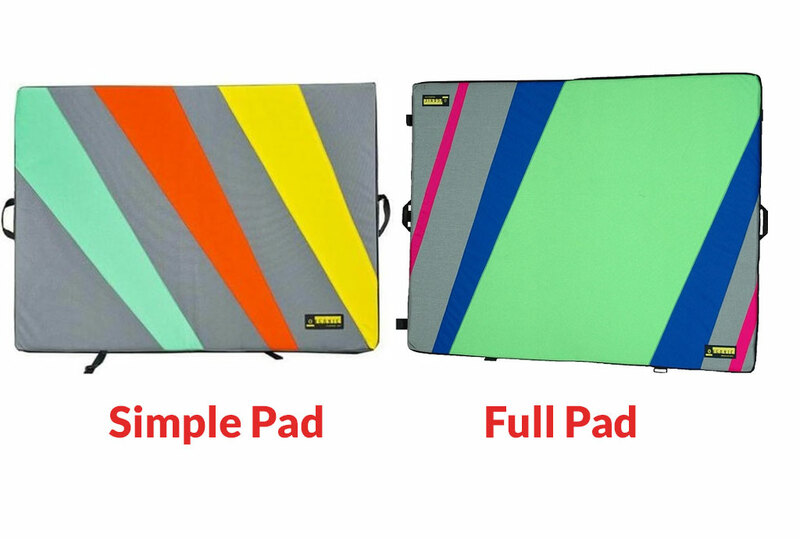 With both pads, you can choose the colors and design when ordering yours. Want regimental stripes of your favorite colors? How about the combination of different geometrical shaped patterns? Organic Climbing makes sure you get a pad with your-requested designs and patterns. If you go to crags that have dust or mud, Full Pad can be the better option. The flap of the Full Pad can keep your straps from becoming dirty. Moreover, if you have the essentials to keep, then the Full Pad looks more feasible than the Simple Pad. You can put the essentials like car keys, water bottles, bouldering shoes, and other essential items in the pocket flap. If you do not like any additional unessential feature, then Simple Pad is the best one in the market. As the name suggests, the pad is really simple which makes it great for those boulderers who do not want any whistles and bells attached on their pad. Furthermore, you save a little amount too if you decide to buy the Simple Pad instead of the Full Pad. Organic Full Pad and Simple Pad are both the great options for boulderers looking for a durable crashpad in the market. With only a little difference, these pads are equally strong, durable, and use the same materials. If you do not want a pocket flap while going for bouldering then go for the Simple Pad. Or else, you can buy the Full Pad which has pocket flaps to help you store your few essentials.